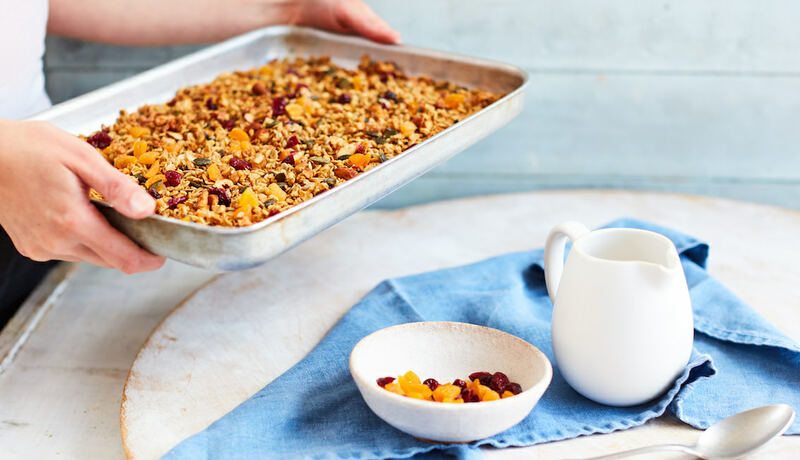 Shop-bought granola is often laced with sugar, but making a healthier, homemade version of this breakfast staple is as easy as 1,2,3. 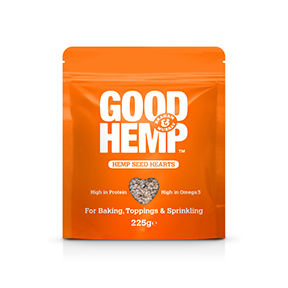 Our recipe makes use of Good Hemp Seed Hearts, which means you’ll get a protein-packed hit of energy in the morning. Pour Good Hemp Chilled Drink over the crunchy goodness for a refreshing start to the day, or sprinkle it over our hemp heart ice cream for a treat. Put the oats, nuts, Good Hemp Seed Hearts and nibs into a large bowl and combine. In another bowl thoroughly mix the oil, syrup, salt and hot water. Pour the liquid mixture into the oat mixture and combine thoroughly. Spread the mixture out evenly onto a large flat baking tray and put in oven. After 15 mins give the granola a good stir to ensure even browning and scrape any oats that are sticking off the bottom of the tray. Give the tray a good shake and put back into the oven. Cook for a further 15 mins or until golden-brown. Allow to cool before adding the dried fruit and storing in an airtight container. Serve with Good Hemp Chilled Drink and enjoy.